Mobile move: T-Mobile’s G1 is the first phone that uses Google’s Android operating system. Google's phone has plenty of potential, but some say its mechanism for delivering applications could lead to problems. At a press conference in New York today, Google and T-Mobile showed off the long-anticipated G1, a powerful smartphone that runs Google's Android operating system for mobile devices. The handset, priced at $179, will be available from T-Mobile on October 22. It boasts features to rank it at the top end of the smartphone market, and its software offers some neat surprises and tricks. At the same time, the G1 undoubtedly lacks the sparkle of the iPhone, probably its closest competitor. Furthermore, some experts question whether Google's scheme for delivering new applications for the phone--an online store called Android Market--could run into problems that slow down mass adoption. As expected, the G1 has a touch screen and a pullout QWERTY keypad, which make it thicker than the iPhone and some other smartphones. 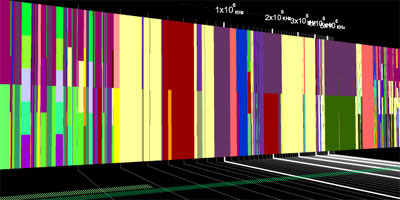 It can make use of T-Mobile's faster 3G mobile network, and it has GPS and Wi-Fi capabilities built in. 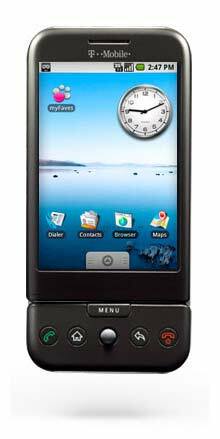 The G1 comes equipped with a 3.1 megapixel camera (but no video camera), an accelerometer to measure motion of the device and orientation of the screen, and a Bluetooth receiver for hands-free devices. The G1 also has one unusual hardware feature: a built-in compass that can determine the direction in which the phone is pointed. While the G1's hardware doesn't make it stand out from the crowd, its software is already causing excitement. Android is designed to enable easy access to Google's Web applications--including its calendar, e-mail, and mapping services--and to instant messaging applications like Google Talk and AOL's Instant Messenger. The G1's Web browser, based on the same software used to make Google's recently released desktop browser, produces scaled-down Web pages that look, for the most part, as they do on a normal computer screen. And the phone's built-in compass has been integrated into Google Maps Street View to let users pan around a streetscape by moving the handset in the corresponding direction. These applications come as standard, but Google and T-Mobile representatives say that third-party applications could take the device well beyond these basics. A slew of applications have already been released, and some have won funding via Google's Android Challenge, a competition to encourage software engineers to develop for the platform. Locale changes the phone's settings based on the time of day, the phone's location, and the owner's calendar, automatically turning the ringer off during meetings, for example. Another downloadable application, Shop Savvy, lets users take a picture of a product's barcode with the built-in camera and instantly compare prices from around the Web. "Several years ago all phones were controlled by handset [makers] with requirements coming from carriers," says Rich Miner, vice president of mobile at Google. "First with Microsoft, then Apple, and now Google, you have people who really understand software and the user experience on these devices. You combine that with higher speed networks and better screen resolution, and all of a sudden, the mobile Internet is here." Applications Galore: Owners of the G1 can download applications such as Locale and ShopSavvy for their phones. Locale (left three images) automatically changes the G1’s settings based on, for instance, the phone’s location, calendar events, and the time of day. ShopSavvy (right image) lets people compare prices of an item by scanning its bar code with the phone’s camera and checking other Web sources. Software apps will be available through Android Market, an online store that can be accessed via the phone. Android Market is similar to Apple's iPhone App Store, in that it is the main method of application distribution. But, crucially, Google will play no central role in vetting applications before they are posted. Instead, developers and users can vote and comment to let others know if an application works as promised or if it drains the phone's battery or makes it crash. According to some experts, this free-for-all approach might lead to quality-control issues in the near future. "I'm totally cheering Android on," says Jonathan Zittrain, a professor of law at Harvard University. "But from what I can tell, [Android Market] is banking on a ratings/reputations systems and common sense for people to know what's okay and what's not." Zittrain says the approach might even hinder Android's progress. "I think [Android Market] may work," he says, "but if there are a couple of well-publicized incidences of code run amok, that can really scare people away from the platform and into Apple's waiting arms." Zittrain says a novel solution to quality control could come in the form of an application that warns users automatically. "I'd love to see an app that reports each phone's vital signs. We need some sense of a nervous system for this thing," he says, so that less tech-savvy people feel comfortable trying out different applications. Minor is confident that the Android Market approach will pay off. "Look at YouTube," he says. "Good things bubble to the top, and if the apps are bad, they will float down to the bottom." Minor adds that the Android platform has built-in security features to limit access to certain types of data and certain functions on the phone. "With Android, our philosophy was [to] make it easy for people to put apps up, but make it so when an app is on a platform, the user knows what functions it's going to be accessing." The first Android phone may not surpass the iPhone in popularity, but its applications will play a vital role in the future of the platform. Within the next two years, says Zittrain, it should be clear whether or not Google's gamble has paid off. The research being conducted at Nokia Research Center focuses on eight areas identified in Agenda 2015: User and Context Modeling, Physically Personal Devices, Human Interface, Mixed Reality, Creativity, Scalable Service Platforms, Internet of Things, Dynamic Wireless. Texting is about to come under intense public scrutiny -- and criticism. The trigger is the recent train collision in Southern California, in which texting apparently played a role in diverting the doomed Metrolink engineer’s attention, but in the next few weeks, Governor Schwarzenegger will also have to decide whether to sign or veto the bill banning texting while driving that is sitting on his desk. Combined, these two events are sure to keep texting in the news. I will bet that the criticism will not be confined to texting while driving trains or even cars, because there is a whole other group of texters whose divided attention can be a hazard to themselves and others -- pedtextrians. “Pedtextrians” are walkers lost in their messaging, looking down at their handheld instead of up at where they are headed. Pedtextrians are people who bump into parking meters and step off curbs when the “don’t walk” sign is flashing. Pedtextrians are one more reminder that all of our portable media -- mobile phones, blackberries, iPhones, and Pearls -- are potent weapons of mass distraction. Lets face it, most of us have enough trouble doing one thing at a time. Put a phone in the hands of a walker, and the consequent diversion of attention lowers their IQ by 10 points. Put a Blackberry in their hand and the act of reading and typing while walking causes their IQ to plummet even further. There are just some things that shouldn’t be done at the same time. For example if you like to birdwatch while you hike, don’t get interested in mushroom hunting, or you will spend your entire time looking up and down, up and down. Walking while tweeting or texting or IMing is thus just plain dumb. Dumb, but not a crime. The good news is that we will all now be reminded of the dangers of becoming a pedtextrian. The bad news is when we all really should be worrying about more important issues, we will now have to suffer through endless chatter about the threat pedtextrians pose to modern society. And of course we will read about it on our handhelds as we trot down the street, rushing to get a latte at Starbucks before we are late to work. Just watch out for parking meters -- and other pedtextrians! 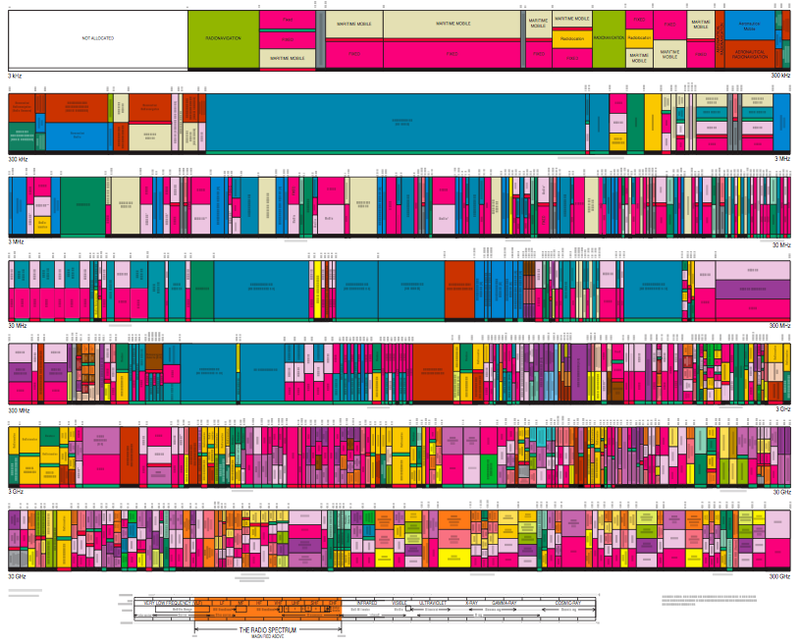 This colorful diagram depicts the allocations of frequencies of the electromagnetic spectrum in the US. It’s stunning to see how revealing the comparison between different media/communication system and the spectrum range they “inhabit”. For instance, blue is “tv broadcasting”. Navigation is very present too. Why do I blog this? Lots of stuff to analyze with these inscription, it’s intriguing to see what you can draw in terms of social organization (as well as assumptions about society) from technical diagrams like this. A nice exercise for the bored reader, try to find 3 hidden patterns about human activities in this representation. On a more user-centric angle, see also “the bubbles of radio”.